I recently had the opportunity to attend the Volatility Windows Malware and Memory Forensics Training. Prior to the training, I used memory forensics (and thus Volatility) in different capacities but it wasn't a technique I leveraged when responding to security events and incidents during incident response activities. This was an area I wanted to improve upon going into the training. As the training went on and more material and labs were covered I kept thinking to myself how I intended to incorporate memory forensics into my response process. To use the technique when triaging live systems remotely over the network. The labs in the training provided numerous scenarios about using memory forensics on compromised systems but I wanted to further explore it with a simulated a security event. This post explores Volatility usage against an infected system's memory image by first determining: is the system infected and if so, how did it become infected in the first place. To set up the simulation I configured an extremely vulnerable virtual machine and then browsed to potentially malicious websites. I suspended the VM to grab the vmem file (memory) once I saw the first indication the system may be compromised. This is where the simulation starts to determine if this system is infected. The picture below shows the partial output from netscan. A few different items jump out. The first is the process 0320.dll PID 3812 listening on the TCP ports 61779 and 8681. These ports are not typically open on Windows systems which made this a good lead. The other item to note is that Internet Explorer was active at one point in time. The program's location in the temp folder made it even more suspicious as being malicious. To get a better understanding about how PID 3812 started I ran the pstree plug-in again without the -v switch to make it easier to see. The Internet Explorer process PID 572 spawned the PID 3812 0320.dll. The netscan plug-in showed that this Internet Explorer was reaching out to the IP address 176.9.176.166. A search with the Malware Analysis search provided a few different hits including one to VirusTotal. The passive DNS showed this IP associated with domains flagged as malicious as well as a malicious file being downloaded from there. To get a better idea about any processes that may had started and exited around the time PID 3812 0320.dll executed I ran the psscan plug-in. I highlighted the other processes that started around the same time but it didn't provide any more substantial leads. To see what access the PID 3812 process had on the system the getsids plug-in was used. The lines below show 0320.dll was running in the context of the lab user account and had administrative rights to the system. The only item of note in the handles output was the process's mutant; maybe it could help in researching in the malware. The next item I explored was the process's loaded DLLs. Listed among the DLLs was one item located in the lab user profile; C:\Users\lab\AppData\Local\sattech.dll. The last item I wanted to explore was to see if the process leveraged code injection with the command. The output showed the following processes had injected code into them: explorer.exe (PID 300), wmpnetwk.exe (PID 2116), iexplore.exe (PID 2504), iexplore.exe (PID 2504), iexplore.exe (PID 572), iexplore.exe (PID 3600), and msiexec.exe (PID 4036). python vol.py -f Win7.vmem --profile=Win7SP0x86 procdump -p 3812 -D .
python vol.py -f Win7.vmem --profile=Win7SP0x86 dlldump -p 3812 -b 0x10000000 -D .
For brevity I'm not posting everything I did to examine these dumped files. The one item I wanted to note was that the strings in 0320.dll referenced the registry key SOFTWARE\Microsoft\Windows\CurrentVersion\Run which may be its persistence. Knowing this was a simulated environment I ran both files through VirusTotal on 5/11/14 (the detections were low: 1/52 for 3020.dll and 10/52 for sattech.dll). I rescanned them while writing this post and the detections increased as can be seen in the 0320.dll VT report and sattech.dll VT report. How Did the System Become Infected? Memory forensics so far was able to confirm the infection, locate malware, provide clues about the malware's purpose, and extract the malware for further analysis. The next question I needed memory forensics to help me answer was how did the infection occur in the first place. An effective technique to address this question is timeline analysis and the Volatility training really opened my eyes to the additional capabilities memory provides to this technique. To fully explore Volatility timelines I'm performing timeline analysis in three separate stages. First only using the $MFT, then the timeliner plug-in (numerous time related objects), and finally the NTFS change journal ($USNJrnl). Exploring the memory image to confirm the infection provided a few leads I leveraged in timeline analysis. There were the two files of interest: C:\Users\lab\AppData\Local\Temp\0320.dll and C:\Users\lab\AppData\Local\sattech.dll. Plus, the timeframe of interest was 2014-05-11 01:46:02 UTC+0000 since this was when the 0320.dll process started. I searched on these indicators and looked at the system activity that proceeded it and occurred after it. However, for clarity I'm presenting my timeline analysis in sequential order. The commands below generates a timeline in bodyfile format with the $MFT records found in memory. Then the timeline is converted with mactime, grep for the date of interest, and then formatted with awk to remove unneeded columns. The image below shows the MFT timeline starting at 05/11/14 01:45:59 UTC. The first few lines show Internet activity with files being created in Internet Explorer's temporary files cache. The last three lines shows activity for the C:\Windows\SoftwareDistribution folder (which is associated with Windows update) and file creation inside the Silverlight application folder (C:\Users\lab\AppData\LocalLow\Microsoft\Silverlight). The timeline continues as shown in the image below. The activity for involving the SoftwareDistribution and Silverlight folders continues before the 0320.dll file is created on the system at 05/11/14 01:46:02. Solely, based on this activity it provides a clue to how the system became infected. There was Internet activity followed by Silverlight activity then malware appearing on the system. This activity points to a drive-by that targeted a vulnerability in the Silverlight application. This shows again the significance of exploring attack vector artifacts and it's an area I've been looking in to for some time (it applies to all types of attacks). I just opted to stop blogging about it and only recently posted the CVE 2013-0074 & 3896 Silverlight Exploit Artifacts documenting Silverlight exploits to provide context to the activity in this timeline. The image below continues with the $MFT timeline. It shows that the sattech.dll file was created on the system one second after 3020.dll. The last portion of the timeline I'm discussing is shown below. The Silverlight application activity surrounds the malware further confirming the attack vector used against the system. In addition, at 01:46:10 artifacts associated with program execution started appearing on the system. There are prefetch files showing both Silverlight application and malware executed. The image below shows the timeliner and $MFT timeline starting at 05/11/14 01:45:59 UTC. Right off the bat the other timeline data pulled from the memory image provided more context about what happened. Various Internet explorer processes were connecting to the freshdekor[dot]com domain. Remember the Volatility netscan plug-in output showed Internet Explorer connecting to two different IP addresses and one of them was 74.125.226.218. One of the Google searches on this IP address lead to a VirusTotal report containing passive DNS information. 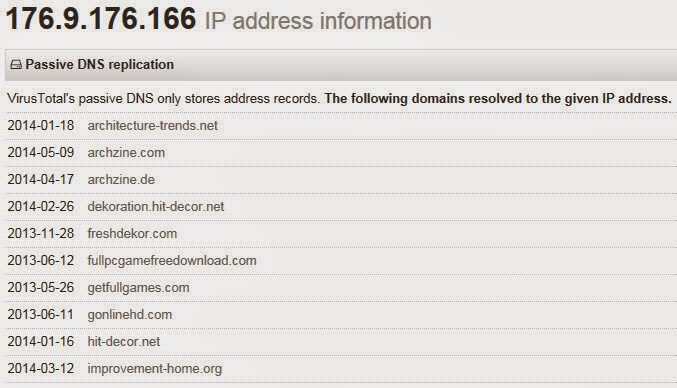 One of the passive domains listed for the IP address was freshdekor[dot]com. It's nice stuff how everything ties together more clearly. The image below continues with the timeline. The activity is for the files in Internet Explorer's temporary files cache but now I know these came from the freshdekor[dot]com domain. The image below is the next portion of the timeline. The first line shows something very cool. The Internet Explorer PID 572 is loading the coreclr.dll dll at 01:46:00. Running grep across the dlllist plug-in showed the full path to the dll which was c:\Program Files\Microsoft Silverlight\5.0.61118.0\coreclr.dll. A Google search for the dll indicated it is a Silverlight plug-in. This line is showing iexplore.exe loading the Silverlight plug-in within a second after visiting the freshdekor[dot]com domain. The third line from the top is cut off in the screenshot but it shows Internet Explorer PID 572 accessing the registry key SOFTWARE\APPDATALOW\SOFTWARE\MICROSOFT\SILVERLIGHT\PERMISSIONS for the lab user account. The rest of this timeline portion is more IE history artifacts for the domain in question. Continuing on with the timeline in the image below. This activity is from the $MFT and was shown previously. However, now it's clear Internet Explorer loaded the Silverlight plug-in for a Silverlight application on a website. The Silverlight activity in this timeline portion was the result of a Silverlight application which was the exploit. The image below continues with the timeline. Besides the threads it is the same activity shown previously involving Silverlight and the SoftwareDistribution folder. Continuing on with the timeline below. This brings us to 01:46:02 which is when the 0320.dll process started. The activity shows the dlls being loaded (minus the sattech.dll dll), process created, and first thread started for 0320.dll PID 3812. This confirmed that the 0320.dll executed as soon as it was dropped onto the system. The image below shows what happened next. The sattech.dll was created on the system and loaded by 0320.dll PID 3812 one second after the process started. The last section I'm highlighting in the timeliner/$MFT timeline is below. The activity is from $MFT records and is the program execution artifacts mentioned previously. The timeliner combined with the mftparser plug-in provided a wealth of information about how the system became infected. It even provide additional information about the attack that would never be found on the host. There is still yet another source of timeline data that can be added to the timeline. During the week I was taking the Volatility training, the instructors gave us the heads up that Tom Spencer released the USNParser plug-in to parse the NTFS change journal. The $USNJrnl is an excellent source to reference as I illustrated in my post Re-Introducing $UsnJrnl. To further explore memory timelines, I downloaded the plug-in and ran the commands below. 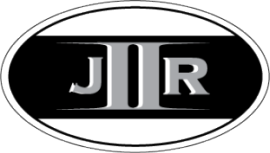 It first generates the $USNJrnl in bodyfile format and then combines it with the timeliner/MFT bodyfile. The timeline is then converted with mactime, grep for the date of interest, and then formatted with awk to remove unneeded columns. The image below shows the $USNJrnl, $MFT, and timeliner timeline starting at 05/11/14 01:45:59 UTC. The $USNJrnl didn't provide much useful in this portion of the timeline since it only shows the edb.log inside the SoftwareDistribution\DataStore\Logs folder. The timeline continues in the image below. The first $USNJrnl activity shows the mssl.lck being referenced. This file was referenced in my CVE 2013-0074 & 3896 Silverlight Exploit Artifacts post. Even if I wasn't aware about these exploit artifacts, mssl.lck can still be tied to Silverlight by grepping for the file in the filescan plug-in output. This shows mssl.lck located in the C:\Users\lab\AppData\LocalLow\Microsoft\Silverlight folder. The image below is the next part of the timeline. The additional information shown in this activity highlights an item that was present in the previous timelines. Prior to Internet Explorer PID 572 loading the Silverlight plug-in (coreclr.dll), the webpage stored in the temporary Internet files cache was named 8fdhe54wg1.htm was visited. This highlights another file to examine closer on the host to determine if it was responsible for serving up the malicious Silverlight application. The image below is the next part of the timeline. The activity is involving the same files and domains already discussed. The timeline continues below. Just prior to the activity for the BITFC11.tmp file in the Silverlight folder there is more activity involving the C:\Windows\SoftwareDistribution\DataStore\Logs folder. This time around it is for the tmp.edb file. The image below is the next portion of the timeline. There is no additional items to note so the timeline continues in the image below. Again, there isn't any additional activity of interest but I'm still posting these images for others to see the timeline in its entirely. The image below shows the next part of the timeline. The $USNJrnl shows activity for the Silverlight application and the timeline continues below. This portion was shown in the timeliner/$MFT timeline where the 0320.dll PID 3812 process started. The image below shows what happens next. After the 0320.dll PID 3812 process started then there is a lot of activity for a tmp file in the Windows\Temp folder as shown below. The $USNJrnl also reflects the sattech.dll file being created on the system. The last image of the timeline shows more information about the Silverlight application and program execution artifacts I mentioned previously. As I went into the Volatility Windows Malware and Memory Forensics Training I wanted to leverage memory forensics more when responding to security events and incidents during incident response. The way I intend to use this technique is for analysis of live systems remotely over the network. As a method to investigate a security alert such as a system reaching out to a known malicious domain. Memory forensics could provide a wealth of information for this type of alert. Tying the specific network activity to a process and then determining where the process came from in the first place. Very similar to the simulation I did for this post. I may had started out wanting to leverage memory forensics more but I ended up with more knowledge and an improved skillset to help me hold the last line of defense for my organization. Two vulnerabilities present in Microsoft Silverlight 5 that in combination enable an attacker to execute arbitary code. "The exploit uses this vulnerability to leak a pointer address in memory, and then uses this leaked address to compute the base address of mscorlib.ni.dll, bypassing ASLR. Later, this base address is used to compute the ROP gadgets in order to bypass DEP." CVE 2013-0074 affects Microsoft Silverlight 5 before 5.1.20125.0. The vulnerability is due to not properly validating pointers during HTML object rendering, which allows remote attackers to execute arbitrary code via a crafted Silverlight application. The TrendMicro article stated this vulnerability "is used to control the execution flow to jump to the ROP gadget." 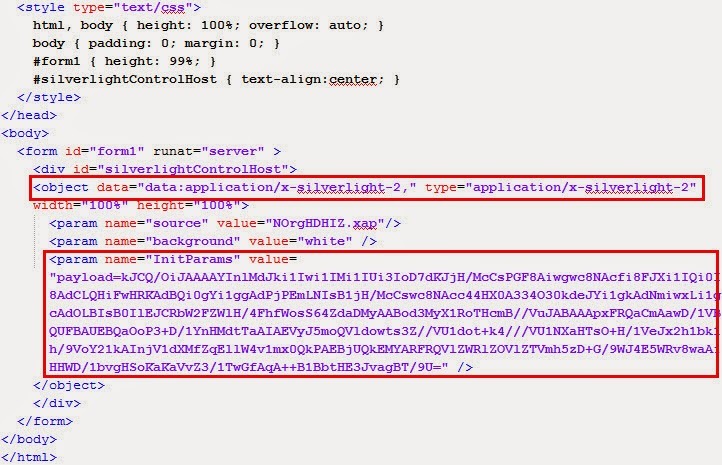 The significance of these Silverlight vulnerabilities is their usage in mass attacks through exploit kits. Furthermore, Packetstorm security posted the exploit code for these vulnerabilities making them public and thus available to anyone to use them including exploit kits' authors. This description was obtained from the very detailed Malware don't need Coffee blog post CVE-2013-0074/3896 (Silverlight) integrates Exploit Kits. To truly understand this attack I highly recommend reading this blog post. 1. User visits a malicious website. 2. The website serves up a malicious Silverlight application to compromise the system. The images below shows the above artifacts in a timeline of the file system from the test Windows 7 SP0 system. The timeline only includes the file system metadata. The purpose of the timeline is to help illustrate what the artifacts look like on a compromised system. A few tidbits about items listed in the timeline that are not discussed above. First, in numerous tests when Silverlight executes it initiates activity in the C:\Windows\SoftwareDistribution\DataStore. This folder is associated with Windows updates and at times it referenced Silverlight activity. Secondly, in numerous tests when Silverlight executes there is activity in the C:\Windows\System32\wdi folder. The files didn't specifically reference Silverlight but the activity was consistent. In both cases, I opted to not include these artifacts until it can be determined that this activity is directly associated with Silverlight being exploited.